As suggested by @StevenJ81 at T54971#4735320, let's try to enable property support before sitelinks here, so that "attempt to index field 'wikibase' (a nil value)" issues on every module-powered pages can be resolved. Liuxinyu970226 added subscribers: Danny_B, Ebe123, Hydriz and 5 others. Does this still need community consensus as it is tagged? I thought that it was generally agreed that this is wanted. I don't think anyone at incubator or beta.wv is *opposed* to this. 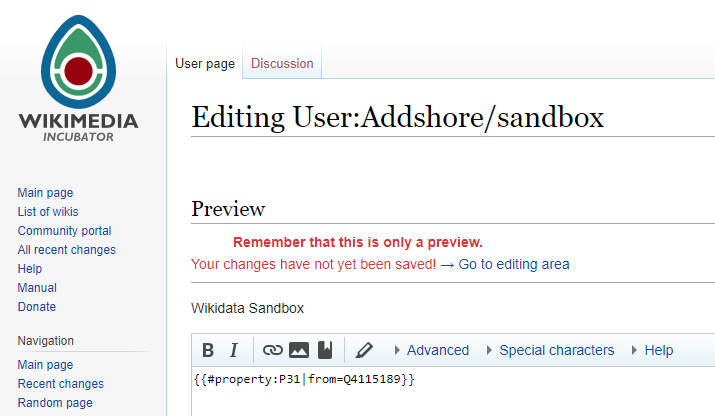 • Addshore moved this task from Incoming to Ready to go on the Wikidata-Campsite board.